Scottish coach David Robertson has turned a startup club into bunch of achievers with help from his owners, players and supporters. Mumbai: Football has stood the test of times in Kashmir, producing international players despite adverse conditions and situation. What it really lacked a national level club, there were attempts in the past but none has come thus far like Real Kashmir in a matter of two seasons. Founded in 2016, the Snow Leopards coming out from a thick white blanket that engulfs Valley during winter have made others take notice. They participated in the I-League second division last season winning it to qualify for the top division. They are showing that they mean business in the top flight by emerging serious contenders to take the title. Currently they are placed second with 32 points from 16 games. They are just two points adrift of toppers Chennai City and both have four games remaining. The club has achieved already so much that Robertson is also surprised but he is focussed to finish on high. “Initially we wanted to stay in the league. Yes, I am surprised where we are now but we are focused to do well in remaining four matches. We just want to do what we normally do to make sure get points on the board. We take one game at a time,” said Robertson whose side has been forced to practice indoors due to heavy snowfall and chill in the valley. Robertson credited the rise to team spirit and support from locals. “We have good team spirit going and players had no problems. We have a fantastic group of players on and off field. They remain together and gel really well. The locals here are very passionate about the game. They come in numbers to support their team. They have been watching it on TV but now Real Kashmir has put Kashmir on football map,” he added. 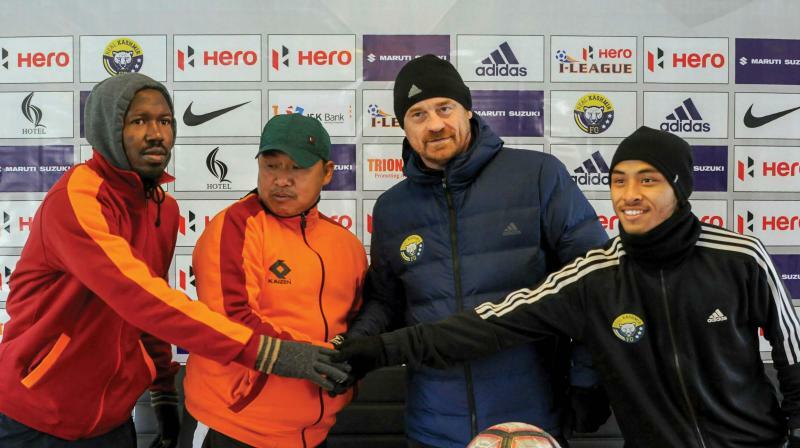 The weather conditions forced postponement of their home game against East Bengal recently but it allowed them to take rest as they host Minerva next on Sunday.